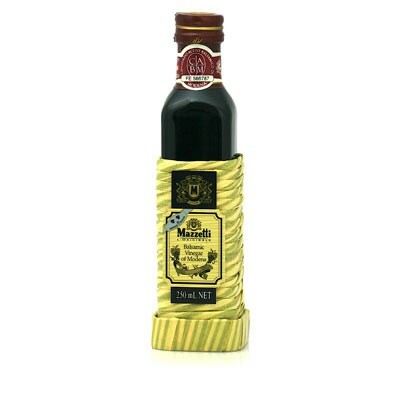 Mazzetti Balsamic Vinegar of Modena is one of the first brands of Balsamic Vinegar of Modena ever exported into the United States from Italy. For over 30 Years Mazzetti has continuously been one of the most reliable producers of Balsamic Vinegar and uses the “Leaf Grading System” which is an independent certification system based on sensory analysis to standardize and guarantee the different quality categories of Balsamic Vinegar of Modena. Contained inside is the high valued 2 LEAF grade, classified as a round and full bodied taste. It is brisk, yet vibrantly balanced.